The photos above were taken in the basement window well at work. During a rain shower, a few years ago, I was working in the basement when I noticed something jumping in the "escape window" well. As I went to investigate, it became clear it was a frog. Apparantly it was hopping around eating the bugs that had been disturbed by the rain. As I watched the frog I started looking around the window well for other frogs. Sure enough there were at least 6 others of different sizes and colors also going after the bugs and enjoying the rain. The window well is probably four feet deep so there was no way for them to jump out. There is plenty of leaves and debris that they can hide under and even absorb the moisture. The leaves were plenty deep that they could survive winters. They certainly have plenty to eat with all the bugs that share their environment. 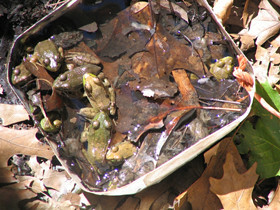 Anyway, just like any normal human being who encounters wild life I took it upon myself to "domesticate" these frogs. That didn't necessarily mean rescuing them. The window well has a 3 foot tall enclosure (in addition to the 4 feet depth) making getting in very difficult. So the next best thing to rescuing them is to make their life more comfortable. So I decided to create a "frog tub" consisting of a half gallon water container with the top three quarters cut off. I punctured holes in two corners and threaded twine through them which would allow me to lower the container without tipping it over. Over the course of two plus years I filled the water container religously (except in the fall and winter). 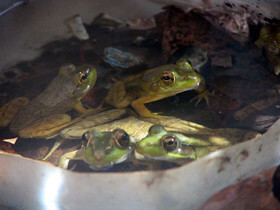 At one point the tub had nearly 10 frogs occupying it's space. It was definitely a popular hangout. So popular in fact, other frogs were waiting to get in. Seeing the dilema I knew I had to create another tub. So I did. That tub also filled to capacity with frogs. I think at one point the maximum number of frogs I counted reached 22. Pretty amazing ecosystem for a window well.